The current bull market has been continuing (with certain fallbacks) for around ten years. This has left people questioning when and, more precisely, where will the next crisis come from. In search of a potential contagion, we had our attention drawn to Canada, a seemingly safe economy which had emerged out of the 2008 crisis minimally damaged. However, certain features of the Canadian economy, such as high household debt levels and extremely overpriced housing market, may lead to a crack in the system. 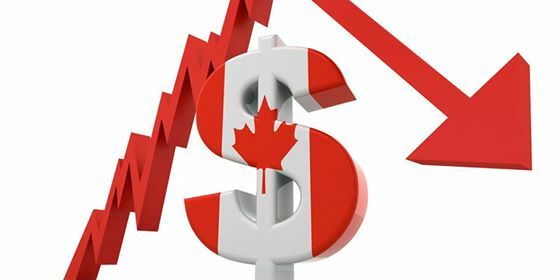 In this article, we will analyse in greater detail the Canadian economy and find out if it actually is prone to a severe correction any time soon. First and foremost, it is clear that something is different about Canada if we look at the Federal Reserve’s and the Bank of Canada’s policy paths. The former started withdrawing liquidity and raised the rate for the first time since the global financial crisis in December 2015, while in Canada it did not happen before the summer 2017. With the US economy experiencing boom, the major significant downside risk to Canada was posed by the abolition of NAFTA, which weighed on all the business activity in the country. Fortunately, the three countries managed to come to an agreement and form a revamped United States-Mexico-Canada Agreement (USMCA), which although awaiting implementation had the effect of reducing all the uncertainties of a potentially hard no-deal outcome. Another important channel is global trade. Here, Canada may be affected by the disruption of the global value chains, as intermediate goods become more expensive with the introduction of tariffs globally. In addition, trade uncertainty is weighing on many non-oil commodity prices, which constitute a large portion of Canadian output. 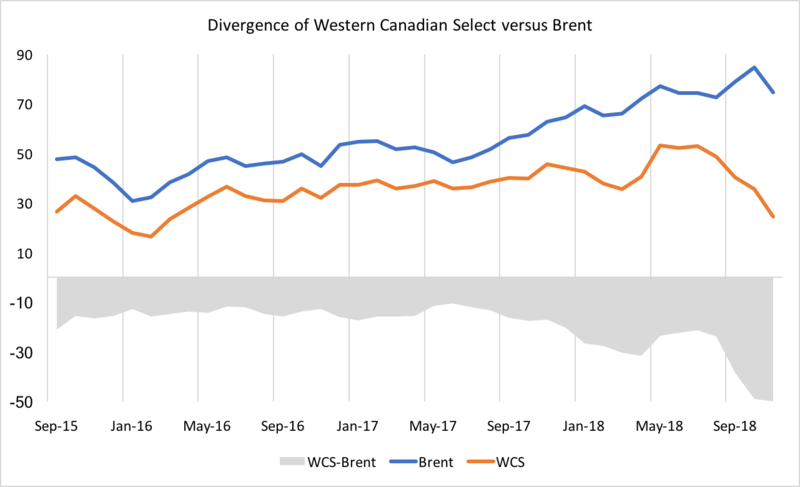 What is more, Canada’s Western Canadian Select is trading below 30 US dollars per barrel, which is due to the excess supply in Alberta and the unavailability of pipelines for delivery of oil across the country. The gap with Brent has reached a low of -50 US dollars, and Canada is certainly not being able to take the whole advantage of the recent positive oil market developments. The graph below shows the probability of sovereign default implied by the 5-year CDS spreads in US dollars and assuming a 25% recovery rate. 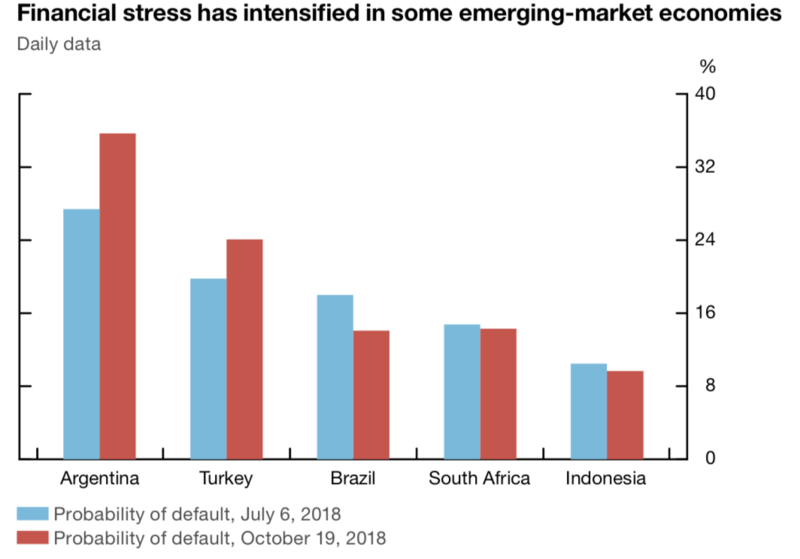 In fact, after three months the default risk subsided in Brazil, whereas Turkey and Argentina now have around 24% and 36%, respectively, probability of not repaying their debt obligations. And the emerging market shock is quite plausible taking into account two factors. First, at least three more rate hikes are on the way. Second, Trump’s harsh foreign policy which includes sanctions against Russia, Turkey and Iran and the tariff imposition on China. So, following the recent developments in the emerging markets, if investors are to start heavily rebalancing towards less risky assets, Canada, as a safe haven, will be the preferred destination. And if there is a significant capital inflow, it may lead to the further appreciation in the value of Canadian assets, including housing, leaving the country even more exposed. According to The Canadian Real Estate Association – CREA, the average Canadian house price in September 2018 was $487,000 (+0.2% YoY). This price comprises $765,000 Greater Toronto Area average price (+2% YoY), and a staggering $1,071,000 average price for Greater Vancouver Area (+2.2% YoY). If we exclude the sales in GVA and GTA, which are the most expensive and most active markets, the national average price falls by $104,000 to $383,000. 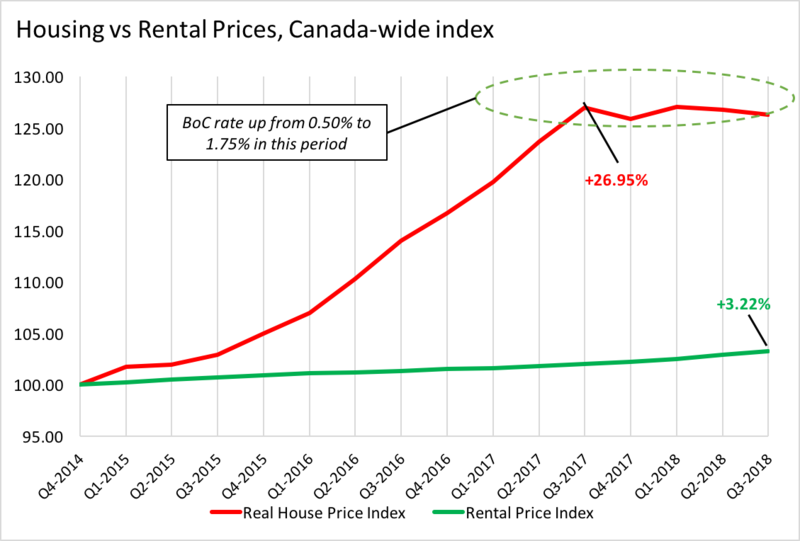 In order to analyse the numbers above, we decided to compare them with the rental prices that demonstrate the population’s basic demand for housing. Represented by the green line on the chart below, the data shows that the cost of renting increased by slightly more than 3% in almost 4 years since the end of 2014. On the other hand, the housing prices have skyrocketed in the 3 years up to the third quarter 2017 – the increase amounted to 27% over the period. 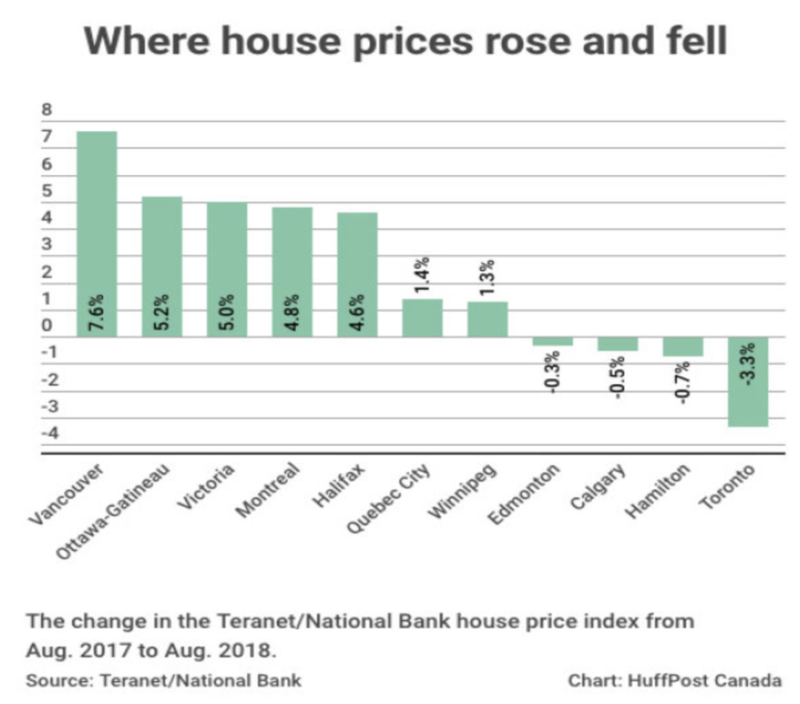 And the housing market remains overheated at those high levels, with most of the increase driven by Vancouver, Ottawa, Victoria, Montreal and Halifax, all up 5%-7% YoY in August 2018 (see graph above). However, despite remaining heavily overpriced, the housing market seems to have lost momentum. In January 2018, the new stress test for low ratio (loan-to-value below 80%, and majority uninsured) mortgages, as part of the revised B-20 Guidelines came into effect. In their try to prevent the creation and burst of a bubble, Office of the Superintendent of Financial Institutions (OSFI) is making it more difficult for first-time buyers to purchase a house. Stricter regulations make it more difficult for people to be eligible for a mortgage. About 12%-20% of potential buyers are expected not to qualify, according to analysts who follow the market. Also, there is a rule stating that any homebuyer who chooses a term between 1 and 4 years, or any variable rate mortgage, must still qualify for their mortgage at the 5-year posted rate, in order to be approved, which will contribute to further decreasing the number of people who qualify. Another recent measure taken in February in British Columbia was the Foreign Buyer Tax. Historically, British Columbia, Vancouver in particular, has been an attractive destination for foreign investment, especially for investors from China. An additional tax of 20% levied on the already-overpriced one-million-dollar houses is expected to strongly discourage the flow of money into the real estate in BC. Last but not least, there were five rate hikes since July 2017 and during the most recent October meeting the Bank of Canada raised the rate to 1.75%. With the overnight rate going up, the 5-year prime mortgage rate is also increasing with a historical premium of 2 percentage points. The estimates for the ceiling of the rate Bank of Canada will set are in range of 2.5% – 3.5%. This would imply 5-year prime rate in range of 4.5% – 5.5% and would increase borrowing cost for new borrowers, but also for the borrowers whose mortgage term expires and need to enter the process of renewal or finding a new lender. Historically, consumption has been the main driver of the growth in Canadian GDP. In turn, extremely low interest rates and sluggish wage growth have prompted the population to resort to intensive borrowing. As can be seen from the chart below, the debt to disposable income ratio of Canadian households is close to 170%. Switzerland, Netherlands, Norway, Denmark – all have higher levels of the ratio. But it is still worrisome, regardless of the recent stabilisation of the ratio. Another factor that seems alarming is the fact that much of the Canadian household debt was raised to finance reals estate purchase. And with increasing cost of debt and higher interest payments, people could start leaving the properties, which in turn can start a decrease in prices of other properties in the neighbourhood, thus set off negative spiral effect. Also, some analysts forecast decrease in Canadian GDP growth rate which will be driven by lower household consumption, as they will try to spend less and repay some of the debt. The only positive thing that has started to emerge as a result of rate hikes can be seen on the graph below. 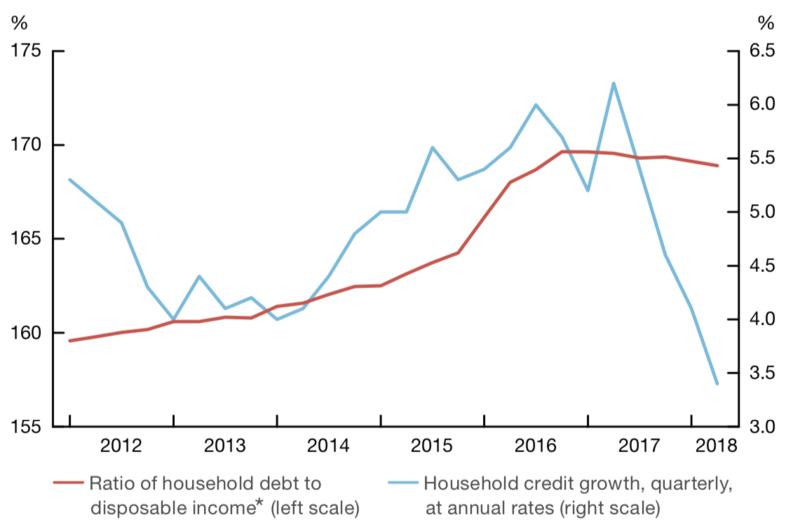 The higher borrowing costs has discouraged some people to take out mortgages, and the household credit growth has been slowing down and almost halved from 6% at the beginning of 2017 to around 3.5% as of the latest available quarter. Certain policy measures mentioned above have helped to prevent further increases in housing prices. However, with imminent rate hikes, the governor of the central bank will surely have a nightmare facing a trade-off between the economy operating at full capacity and the downside risks connected with the overpriced housing market. For this reason, we need to monitor closely how increasing interest rates affect debt, consumption and mortgage dynamics because of the risks they pose to financial stability and the economy not only of Canada, but of the whole world.